We’re excited to announce that we have expanded the SQL grammar in DocumentDB to support aggregate functions with the last service update. Support for aggregates is the most requested feature on the user voice site, so we are thrilled to roll this out everyone that's voted for it. Azure DocumentDB is a fully managed NoSQL database service built for fast and predictable performance, high availability, elastic scaling, global distribution, and ease of development. DocumentDB provides rich and familiar SQL query capabilities with consistent low latencies on JSON data. These unique benefits make DocumentDB a great fit for web, mobile, gaming, IoT, and many other applications that need seamless scale and global replication. Whether you’re building a mobile game that needs to calculate statistics based on completed games, designing an IoT platform that triggers actions based on the number of occurrences of a certain event, or building a simple website or paginated API, you need to perform aggregate queries against your operational database. With DocumentDB you can now perform aggregate queries against data of any scale with low latency and predictable performance. Aggregate support has been rolled out to all DocumentDB production datacenters. You can start running aggregate queries against your existing DocumentDB accounts or provision new DocumentDB accounts via the SDKs, REST API, or the Azure Portal. You must however download the latest version of the SDKs in order to perform cross-partition aggregate queries or use LINQ aggregate operators in .NET. As an elastically scalable NoSQL database, DocumentDB supports storing and querying data of any storage or throughput. Regardless of the size or number of partitions in your collection, you can submit a simple SQL query and DocumentDB handles the routing of the query among data partitions, runs it in parallel against the local indexes within each matched partition, and merges intermediate results to return the final aggregate values. You can perform low latency aggregate queries using DocumentDB. For a complete example, you can take a look at our query samples in Github. Learn more about DocumentDB’s LINQ support, including how asynchronous pagination is performed during aggregate queries. 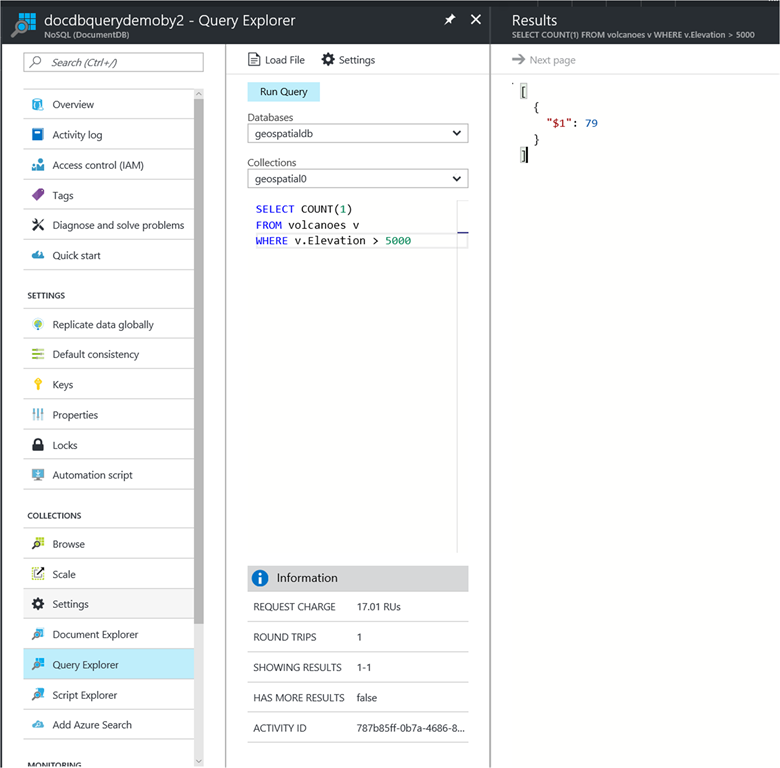 You can also start running aggregate queries using the Azure Portal right away. 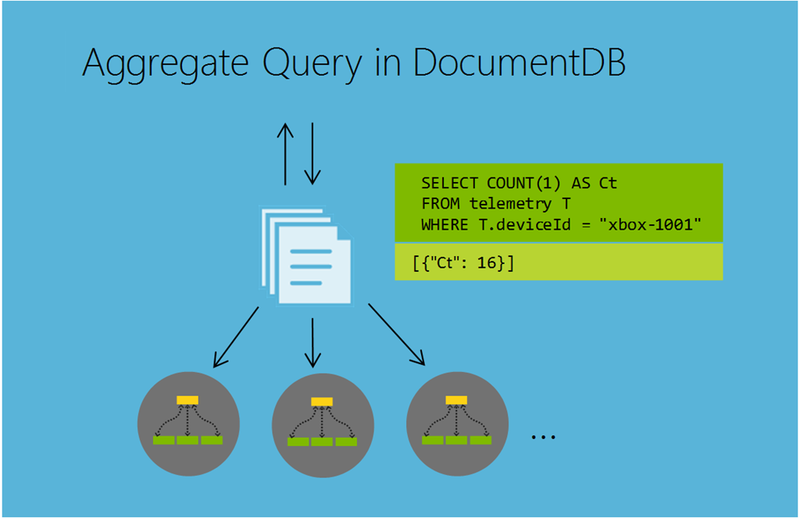 In this blog post, we looked at support for aggregate functions and query in Azure DocumentDB. To get started running queries, create a new DocumentDB account from the Azure Portal. Stay up-to-date on the latest DocumentDB news and features by following us on Twitter @DocumentDB or reach out to us on the developer forums on Stack Overflow.